Ever wanted to live like a gangsta? Click here to play! Love the look of the lifestyle, but don't like the constant threat of drive-bys, arrests, or overdose? Then the Loaded slots are definitely for you, offering the opulence of being a true gangsta rapper, but without the terrifying realities. 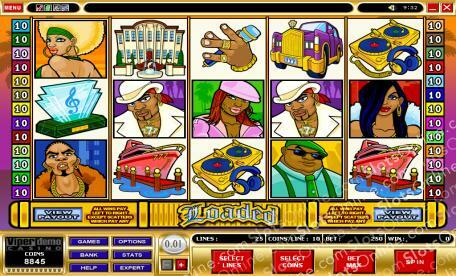 In the Loaded slots, you get to enjoy music, money, pimped out cars, palatial estates and massive yachts. You also get flunkies and fine lady friends, all in awe of your musical abilities and unsurpassed rhyming skills. Just be sure to make wise investments with your money, or else you could end up like many a self-declared untouchable rapper. The Mic symbol is the scatter in this game, and it pays out on the total bet when 2 or more land on the reels. It also triggers the free spins bonus feature when 3 or more land on the reels. The Triple 7 Rapper symbol is wild, and triples the win of any payline it substitutes on. The free spins feature awards free spins if 3 or more scatter symbols land on the reels. The player can choose 12 free spins at a 4 times multiplier, 16 free spins at a 3 times multiplier, or 24 free spins at a 2 times multiplier. There is also a gamble feature that allows the player to gamble wins on the reels. In this game, the player tries to guess the color or suit of a playing card. A correct guess of color doubles the stake, and a correct guess of suit quadruples the stake. An incorrect guess forfeits the stake.